Nigeria women's team are hoping for a better campaign than two years ago after landing in Windhoek ahead of the African Women's Championship (AWC) in Namibia. The six-time champions are the most successful team in the history of the competition and last won the trophy in 2010, when they beat Equatorial Guinea 4-2. But the Super Falcons endured a torrid tournament two years later, finishing fourth in Malabo, their worst finish. And four-time African Footballer of the year, Perpetua Nkwocha, says they are determined to bounce back at the 11-25 October finals. "There is one target in Namibia and it's to reclaim our African title," Nkwocha told BBC Sport. "Our present squad is a blend of old and young players, which should give us an extra edge over the other teams." Their quest for the title is boosted by the absence of reigning champions, Equatorial Guinea, who failed to qualify for this year's event. Although Nigeria are expected to comfortably qualify from Group A, which includes hosts Namibia, debutants Zambia and Ivory Coast, the West Africans are not underrating their group rivals. "The other countries in our group are desperate to beat Nigeria and we respect them," said Nkwocha. "Maybe we are also lucky that Equatorial Guinea is not coming but we are not going to be complacent." Asisat Oshoala, top scorer and Most Valuable Player as Nigeria reached the final of the 2014 U-20 Women's World Cup in Canada in August, craves that winning feeling as they seek redemption in Windhoek. 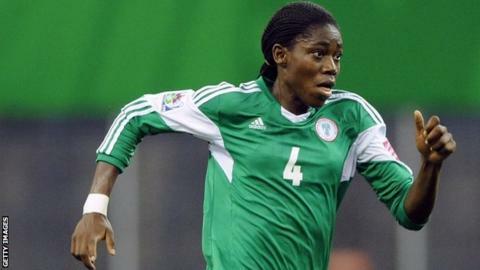 "I played in the last tournament in Equatorial Guinea where we only suffered a setback," said Oshoala, who plays her club football in Nigeria. "Our performance then gave people the wrong impression but we need to show them that we are back to our best. "We are at full strength with experienced players here to lead us in Nkwocha, Oparanozie and others. "The Super Falcons are on a redemption trip, we share a common focus and bond in this team and our opponents should be worried. "We are not bragging when we say we are coming back like wounded falcons and that's bad news for our rivals." Super Falcons coach Edwin Okon has named 11 players from local side Rivers Angels and six foreign-based stars in his 21-member squad. His team includes 19 players with World Cup experience - veterans Stella Mbachu and goalkeeper Precious Dede among them. The Nigerians will open their campaign against Ivory Coast on 11 October, before meeting Zambia three days later and hosts Namibia on 17 October. The tournament will also serve as qualification for the Fifa Women's World Cup to be held in Canada from 6 June to 5 July, 2015. The top three nations from the two-week long event will represent Africa in Canada. Nigeria is the only African team to have played in all Fifa Women's World Cup tournaments since 1991. But they have failed to translate their continental dominance on the world stage, as their best performance came in 1999 when they reached the quarter-finals.